Pictured from left, Commissioner Rick Handley, AJ Powell, Tammy Trippett, Milt Trippett, Nikki Powell, Commissioners Tracy Doolittle and Sam Nibert. GLENWOOD — When travelers along Route 2 slow down to 45 miles per hour in Glenwood, they are passing by a business that is the heart of a community. 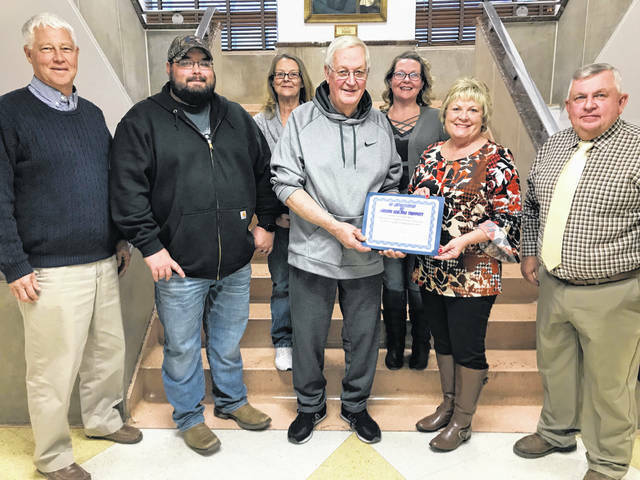 Trippett’s Dandi Mart (also known as Milt’s Mart) was honored by the Mason County Commission recently, as a longtime, locally owned business in the county. Invited to the recent commission meeting were Joseph Melton (Milt) Trippett, and his family. Commissioner Rick Handley, on behalf of himself and Commissioners Tracy Doolittle and Sam Nibert, read through a history of Trippett’s before presenting Milt with a certificate of appreciation. On Jan. 1, 1961, Milt and his father Tom, went into business as a Pure Oil station that would later become today’s Trippett’s Dandi Mart. In 1975, Milt and his wife Mary Jean purchased Tom’s part of the store and together became sole owners/operators of what was at one time a full-service gas station and garage. In the 1980’s, Trippett’s began the transition into a convenience store. After years of different affiliations with oil companies, it is also now a completely independently owned gas retailer as well, for those needing to top off their tanks. Together with his family, including daughters Tammy and Vicki; his granddaughter Nikki, her husband AJ, children Ali and Eli; his grandson Jeff and wife Shaina, it truly is a family-run business, according to commissioners. The certificate of recognition read, in part, that it was to Milt and Trippett’s Dandi Mart for over 57 years of public service to the citizens of Mason County.